Get your school and school website ready for back-to-school. Back-to-school jitters aren’t just for students and teachers; administrators certainly get their share of the stress that comes along with that first day. Your to-do list may seem a mile long, but a successful opening day really just boils down to a few key points. There will be a lot going on the minute your front doors open. From late registrations and student schedules to maintenance issues and playground duty, your office will be abuzz with activity. Do you have a plan of action to address issues as they arise? If this is your first year, depending on the veterans on your staff for advice about what areas generally need special attention on the first day can help tremendously. And remember to expect the unexpected. Even with the best laid plans, things sometimes go awry. The better you’ve prepared, the more able you’ll be to go with the flow while still keeping a level head. And, don’t forget to make effective use of that website! The best school websites are a 24/7 handy reference for parents and will save your office staff time by providing answers to those common back-to-school questions. Make access to information convenient with a mobile friendly website (responsive school website) that includes website accessibility for parents with disabilities. Everyone on your staff has a role to play in helping to make the first day of school a success. Be sure to communicate your needs to all the key players so that when you have to make that inevitable maintenance request, your staff already knows what to do. Once the kids arrive, teachers will want to focus their attention entirely on their students. Ensure ahead of time that they won’t have to worry about issues like not having promised materials or inaccurate rosters. Delegating responsibility and making sure everyone knows what their role is will also help everyone stay on the same page, even if things get a little crazy. One way to save them some stress is to get that district website updated with all the necessary information parents need. Are enrollment forms online and easy to complete and submit? Are office hours and school hours clearly included on your contact page? For each of those school sites, are they pertinent to their customers? Is the high school website calendar current with athletics schedules, clubs and extracurricular activities, and other information parents and students need? Is the middle school website written to help students make the often difficult transition from elementary to middle school by providing student tips, elective options, and conduct expectations? Does the elementary school website provide classroom supply lists, lunch menus, and school start and end times as well as any early release days and times so parents can plan for those? With school choice being an option to parents, the more you do to make yours that school of choice, the easier your job will become, and the happier your staff and parents will be. Effective school communication and school customer service are the keys. You can help relieve the nervousness your students and parents are feeling by making them feel welcome and cared for every chance you get. There are many opportunities to introduce yourself even before your students arrive, including in-person at an open house or back-to-school night and in writing on your school website. Many parents will use your school website to gather information about needed supplies and important dates and forms, so be sure it is current and welcoming. Be sure to include a welcome letter from the administration to let parents know some of your goals for the year and that you’re excited about getting started. From the moment those doors open to the moment they close on that first day, be visible! Parents and students should become accustomed to seeing everyone involved in their child’s education around campus. That way, when they have questions or concerns, they’ll feel comfortable seeking you out. Remember, even when everyone seems too busy to notice, a welcoming smile goes a long way. When the last bell rings, you can pat yourself on the back for a job well done. Be sure to make the rounds and check in with your staff, congratulating them on the successful start to another new year. Finally, after all that first-day prep has paid off, after all the meeting and greeting is done, you can sit back and see the positive impact you’ve had. Are your kindergartners and their parents ready? Some parents are anxious about whether their child is really ready, socially and academically, to start kindergarten. Schools can help by offering information on the kind of behavior and performance that’s generally expected from kindergartners. Over the summer, consider sending a kindergarten readiness packet that includes introductions, supply lists, classroom rules, reading lists, and maybe a fun worksheet or two. For those parents you don’t have addresses for, add a section on your school website that includes the information in your kindergarten readiness packet, and make it easy to find and share by posting the information on all of your social media as well (with links to your school web page). Summer is a great time to gear up for the next school year, and parents will appreciate the chance to help their child brush up on some skills in time for that first day. Use inexpensive alphabet refrigerator magnets and play games (like hide and seek or matching them with pictures) to help your child recognize some of the letters. Make some letter flashcards and use them to play a game of alphabet Go Fish. Have your child pick a flash card, and help them find items around the house that begin with the same sound as the card they selected. Help them identify the beginning sounds of each household item. Emphasize the beginning sound, have them repeat it, and praise their successful efforts. Help your child practice writing letters, starting with the letters in his or her name. Make writing letters fun by letting them write in shaving cream in the bathtub, salt or sugar on a cooking sheet, or with finger paint. Play games with your child to find objects of particular colors or shapes around the neighborhood as you drive (e.g., I spy with my little eye a red octagon = stop sign). Draw various shapes on construction paper. Have your child cut them out with child-safe scissors, and help them name them (for both color and shape). With your child, name the numbers you see printed on food boxes or house addresses. Read to your child frequently, running your finger under the words as you read. It will help you child see how reading takes place (left to right, top to bottom). Play rhyming games with your child, like having them help you say all the words they can think of that rhyme. For example, words that rhyme with cat (hat, mat, sat, pat). For new parents and students alike, a lot of the nervousness can be relieved by simply introducing yourself in person! Host an event near the beginning of the school year where everyone gets the chance to meet one another and get their bearings around campus. Allow students to see their classrooms, tour the library, the playground, and the lunchroom, and really get them excited about starting kindergarten. Be sure to include the school principal, all the kindergarten teachers, and other people the children will see on a daily basis. 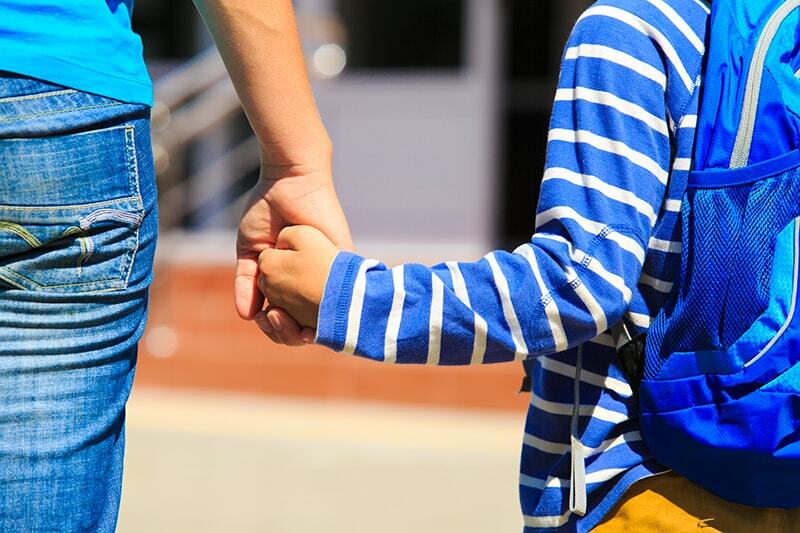 Administrators often find that parents of kindergartners will display a whole range of emotions when they leave their young child behind on the first day of kindergarten. Why not give them a chance to commemorate the occasion after drop-off? Whether parents are a little sad about letting their baby grow up or they’re excited about the prospect of a little free time at home, allow them to share those emotions with the administration and other parents. Hosting a quick “Boohoo/Yahoo” gathering in the library or school office after the first bell rings is a great way to get to know parents and let them network with one another. After all, fostering those relationships is one of the ways you will continue to build a strong school community for years to come.